Sunday night, we rode home from the grocery store in a bulldozer. The piles of dark-colored blankets and pillows on the floor are water, perfect for swimming around in, as is the pile of wrapping paper in the living room left over from New Year’s Day. Those Duplo constructions parked on a Rubbermaid tub in the studio? Airplanes waiting at the airport. You can, I hope, guess which member of our family is the creative mind behind those discoveries. Our young sir Kiddo has quite an imagination spinning in that head of his. It’s endearingly entertaining. It does at times make it more challenging to figure out what he’s so enthusiastically telling us. We can’t go off contextual clues when the context is all in his head. The tough part for us lately is holding back from asking leading questions about what he’s dreaming up. 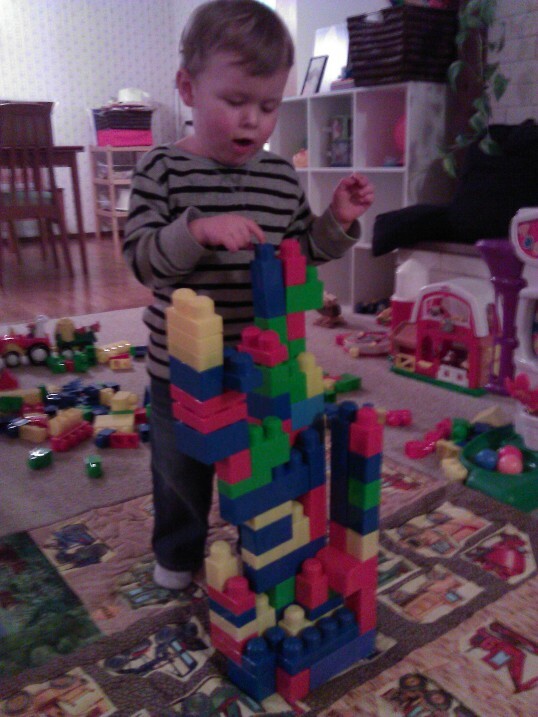 If he’s decided that his Mega Bloks tower is the airport, I don’t want to squelch that line of imagination by asking whether it’s a house. I feel a little regretful when he changes his own idea to fall in with ours. But more and more lately, he’ll reply that NO, Mom, it’s the AIRPORT. Duh. He’s picked up my habit of making up silly little songs too. The other night at bedtime he asked me to sing the Mommy Song. “Mommy Song?” I asked, buying time while I tried to remember it. He helped me out by singing it: “Mommy and Daddy and Kiddo, Mommy and Daddy and Kiddo…” All him, ladies and gentlemen. Call to inquire about bookings. Eventually, I’m sure, he’ll realize that he can tell us things that aren’t true. He hasn’t quite gotten to the point of lying, which is actually a developmental milestone, according to a study from the Institute of Child Study at Toronto University published last summer. Sometimes he does deliberately answer No when he knows we’re expecting a Yes answer (“Did you open the microwave when we told you not to?”) but he hasn’t yet started making up full-blown lies intending to get him out of trouble. At the rate he’s going, that’s probably not too far away, and that will be a whole ‘nother can of worms. But until that happens, we’ll just grin silly grins when he starts telling us about how Doggie and Cookie Monster are riding on a boat and a helicopter and a train. Categories: Family Time, Parenting | Tags: imagination, kiddo, kidspeak, lying | Permalink.